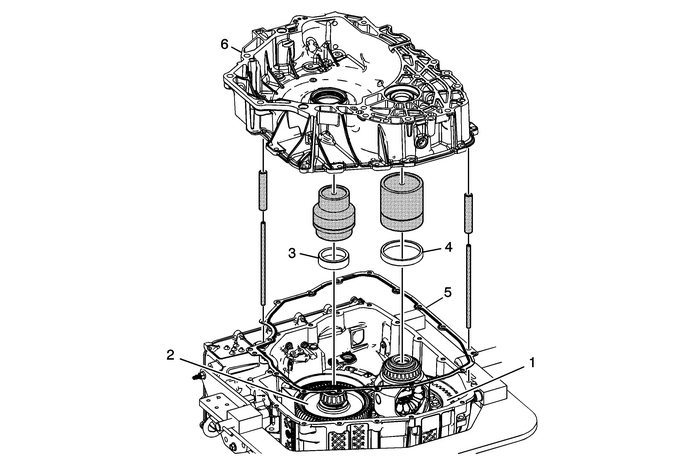 Note:Install the differential assembly and the pinion gear assembly together to avoid interferencewith the gears during installation. Note:After placing the bearing cup on the gear, place DT-47800-2 which is part of DT-47800 selection gauge kit, onto the bearing cup. Note:After placing the bearing cup on the gear, place DT-47800-1 which is part of DT-47800 selection gauge kit, onto the bearing cup. Install 2 DT-47800-6 which is part of DT-47800 selection gauge kit, into a case threaded hole at approximately 180-degrees apart.Some alignment of DT-47800-1-and-2 which is part of DT-47800 selection gauge kit, may be required while lowering the TC housing onto the case.Install DT-47800-3 which is part of DT-47800 selection gauge kit, spacer over DT-47800-6. ProcedureInstall the remaining spacers evenly at every other bolt hole.Remove the DT-47800-6 which is part of DT-47800 selection gauge kit, guide pins and install spacer bolts in all bolt holes at spacer locations.Tighten the bolts in sequence. Caution:If the bearings are not properly seated into the bearingcups, the washer selection will be inaccurate and the bearingpre-load will be set too low. 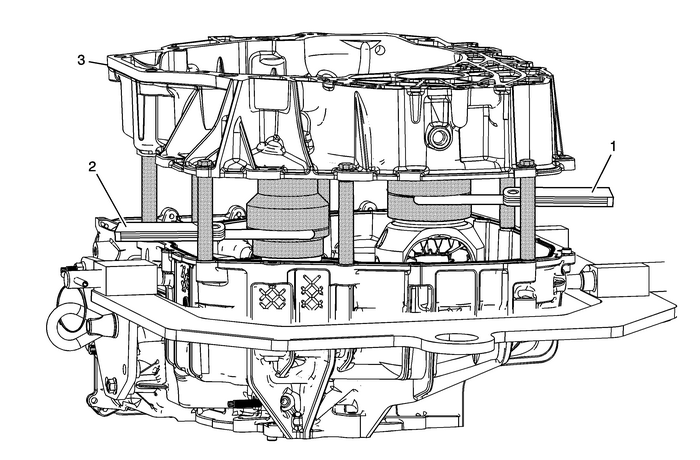 Low bearingpre-load will cause premature failure of the frontdifferential drive pinion gear. Rotate the differential assembly 10 revolutions to allow the bearings to seat intothe cups. Note:Differential rotating tool DT-47793 differential rotating tool can be used to rotate the differential from the case side. Caution:Improper thrust washer selection can cause insufficient taperbearing pre-load which will cause premature failure ofthe front differential drive pinion gear. Place DT-47800-7 in the gap in DT-47800-2 which are both part of DT-47800 selection gauge kit, to determine the proper thrust washer. Choose the correct thrust washer. Refer toTaper Bearing Preload Selective Specifications. Continue trying different sizes of DT-47800-7 which is part of DT-47800 selection gauge kit, until the gauge will no longer fit into the gap. The correct thrust washer sizeis equal to the largest blade gauge that fits into the gap.Match the size of the correct DT-47800-7 blade which is part of DT-47800 selection gauge kit, to the color code in the thrust washer specification chart. The washer color codingis on the outside diameter of the washer.The gap in DT-47800-2 which are both part of DT-47800 selection gauge kit may not be even. Hold the top of the gauge and rotate the bottom of the gauge toeven out the gap. Take two gap measurements 180-degrees apart. Average the two measurementsand select the thrust washer that is closest to the average.The washer color coding is on the outside diameter of the washer. Place DT-47800-7 in the gap in DT-47800-1 which are both part of DT-47800 selection gauge kit, to determine the proper thrust washer. Choose the correct thrust washer. Refer toTaper Bearing Preload Selective Specifications. Continue trying different sizes of DT-47800-7 which is part of DT-47800 selection gauge kit, until the gauge will no longer fit into the gap. The correct thrust washer sizeis equal to the largest gauge that fits into the gauge.Match the size of the correct DT-47800-7 blade which is part of DT-47800 selection gauge kit to the color code in the thrust washer selection chart.The gap in DT-47800-1 which is part of DT-47800 selection gauge kit may not be even. Hold the top of the gauge and rotate the bottom of the gauge toeven out the gap. Take two gap measurements 180-degrees apart. Average the two measurementsand select the thrust washer that is closest to the average.The washer color coding is on the outside diameter of the washer. ProcedureRemove DT-47800-3 which are both part of DT-47800 selection gauge kit, bolts and spacers.Remove the torque converter housing.Remove DT-47800-1 and DT-47800-2 which are both part of DT-47800 selection gauge kit.Remove the torque converter housing seal.Remove the pinion gear and differential bearing cups.Install the bearing cups and thrust washers into the torque converter housing perthe replacement procedures. 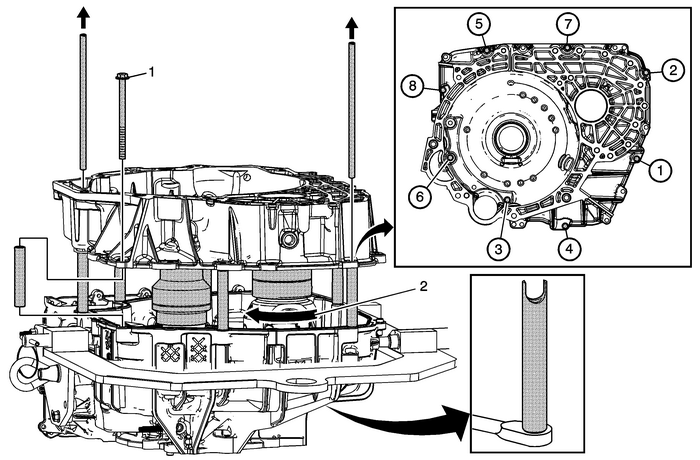 Refer toFront Differential Carrier Bearing Cup and Washer Replacement - Torque Converter HousingSideandFront Differential Drive Pinion Bearing Cup, Washer, and Lubricant Dam Replacement- Torque Converter Housing Side. Note:DT-47800-1 and DT-47800-2 which are both part of DT-47800 selection gauge kit, may stick in the torque converter housing. Be careful not to drop the gauges.